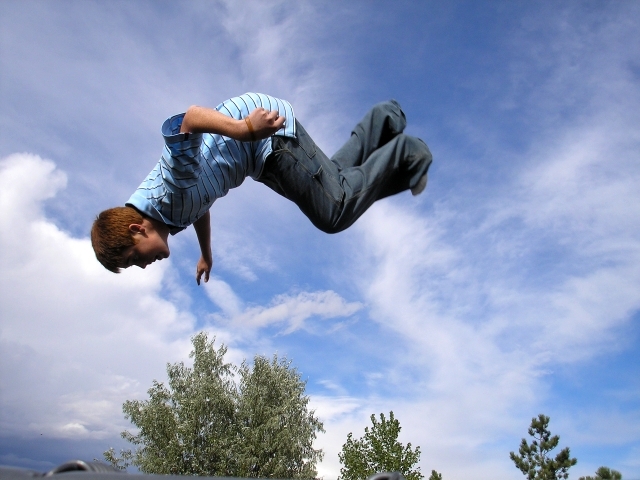 Trampolining is enjoyable, sociable and good for fitness according to British Gymnastics, and especially popular with children aged between four and 15 years. Garden trampolines should provide healthy, safe fun for all the family and, of course, are left outside in all weathers. As a result, you should look for specific characteristics in terms of shape, size and build quality when choosing a trampoline for your garden. Garden trampolines come in various shapes and sizes, although circular trampolines with diameters of 10, 12 or 14 feet are fairly standard. You also need to choose a size that fits comfortably into your garden. A safety net affords some protection against falling off, but won't necessarily prevent users from colliding with fences, trees, walls and other solid objects in close proximity to the trampoline. So, allow adequate clearance, of eight feet or more, on all sides. Bear in mind, too, that if you choose a non-standard size you're likely to find it difficult to find spare parts if you ever need them. In terms of build quality, look for a trampoline with a sturdy, galvanized frame that won't bend or buckle under the weight of its heaviest user and won't rust. Check that the cuts across frame sections are smooth, without any jagged edges, and do likewise for any welds on the trampoline frame. Aside from the frame, garden trampolines consist of a bed, which is the part you bounce on, springs, which provide the bounce, and pads, which cover the springs and prevent you from accidentally putting your feet through them. There's typically not much to choose between trampoline beds, but try to find one that's fire retardant to prevent sparks from bonfires and cigarettes from burning holes in it. Springs typically come in standard configurations - 80 x 8.5" springs for a 12' diameter, 96 x 8.5" springs for a 14'diameter and so on - and if you choose a trampoline that conforms to the appropriate safety and quality standards you should be fine. However, avoid springs that are 6" or less in length. Pads are the components that are likely to wear out first, so look for pads made of heavyweight impact foam covered with thick, high quality vinyl if you want to use your trampoline regularly. If you need more information on the technical specifications of garden trampolines and trampoline safety, have a look at the website of any reputable trampoline manufacturer or retailer, or the Royal Society for the Prevention of Accidents (RoSPA). By doing your research now and choosing the trampoline that's best for your particular garden, you can make sure that you and your family enjoy years of safe trampolining fun!